Friday night Chris and I were invited to dinner by two of my coworkers who wanted to share with us some classic Hungarian dishes; a tour around the country, if you will. 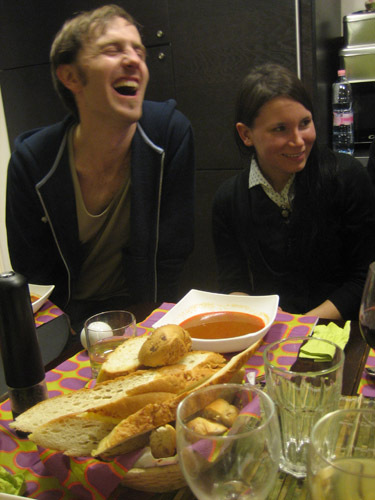 They also invited a few other friends and the evening was filled with laughter and interesting new food experiences. 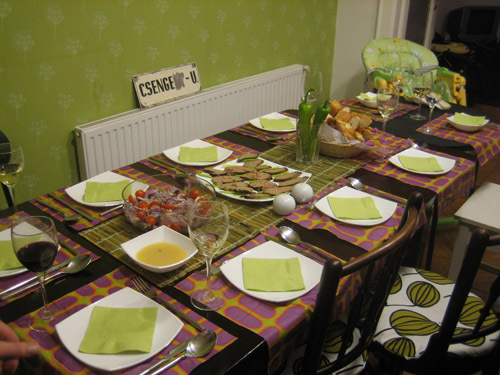 The table itself was scrumptiously decorated. 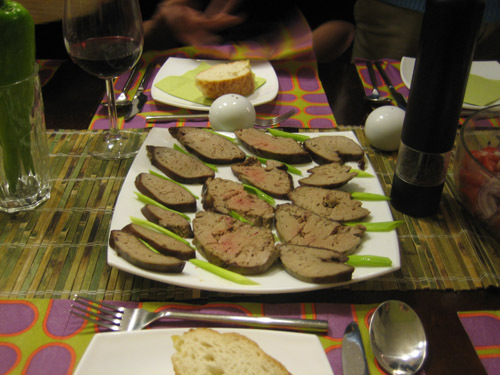 First up was a goose liver appetizer. The proper procedure for eating it is as follows: First take a piece of bread and spread onto it a thin layer of goose fat (bottom left on the table). Then put a piece of perfectly cooked liver on top and sprinkle, or should I say pour, salt onto the liver. After that comes a red onion/tomato mixture and if you are really daring (I am not) add some spicy peppers. Then take a bite and wait for a taste explosion. Here's a close-up shot of the goose liver in case you vegetarian readers haven't had a good enough look to turn you back into meat-eaters. Just kidding, I love you veggies! Don't ever change. Especially for goose liver. Although it is seriously delicious despite it's ethical ambiguity. But that's a whole other post. 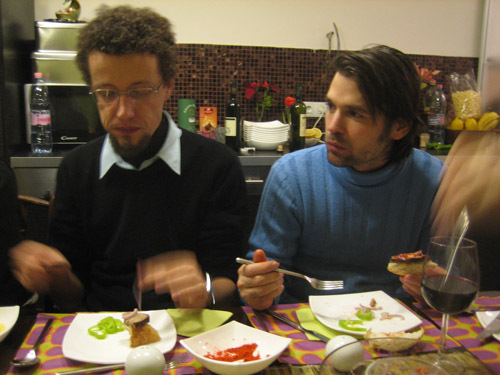 Gabor and Peter are thoroughly enjoying their appetizers. Peter, on the right, was our host. 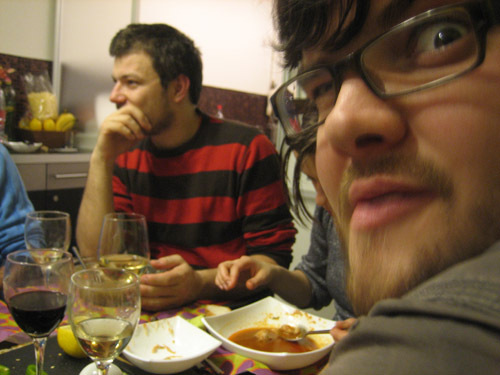 Gabor is a nice guy who is well-skilled at Hungarian dinner parties. Probably because he is Hungarian. 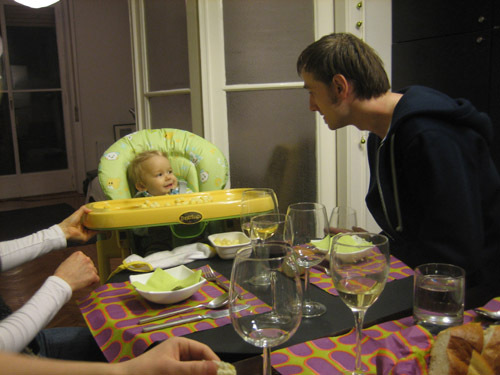 Peter's baby and Andras enjoyed some serious conversation. Probably something related to how small the little tyke feels in his gigantic high chair. 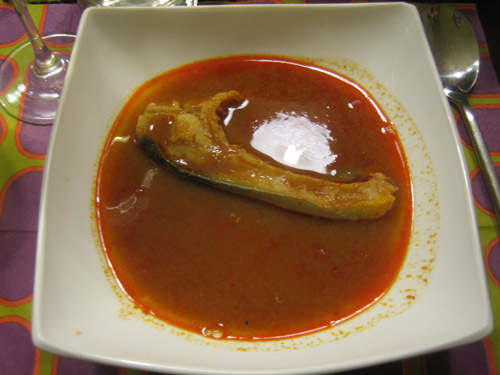 The next course was fish soup. 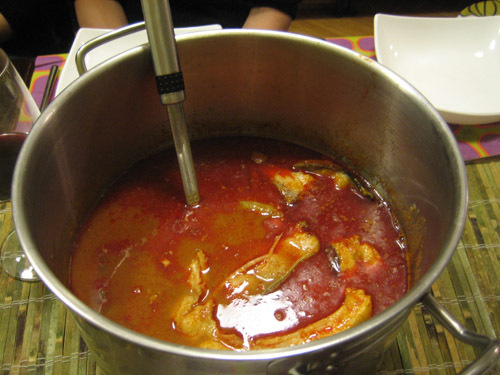 Fish soup is quite the staple in Hungary. The most common sources of the fish are the Danube River and this other river whose name I cannot recall. A huge debate ensued when this information was told to us as to whether fish from the Danube or the other river was better. Considering that I see what the Danube looks like on a regular basis, I voted for the other river. The fish in this soup was carp and each person got a healthy piece along with a warning that if we didn't watch out for bones, we may not survive the night. Peter has been to the hospital twice because of swallowing bones, yet he still makes this soup. What selfless hospitality. Andras is the life of any party he attends and this night was no exception. I think he had just finished telling a dirty joke when I took this photo. Although I am pretty sure he has just finished telling a dirty joke in every picture I have of him. And then came the main course....kocsonya. Don't ask me how to pronounce it. 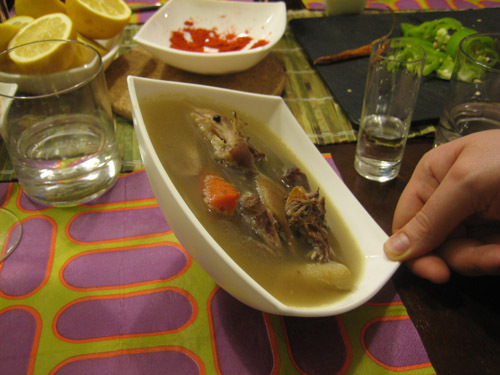 As you can see from the photo, kocsonya is a gravity-defying meat soup. My best guess is that this dish came about because someone making meat soup suddenly remembered that they had to feed the cows and ran out of the house carrying the kettle. They set the kettle down by the front door and an hour later, after sitting in the cold for so long, the broth became a hard gelatinous blob. Since microwaves had yet to be invented, the family had to eat the soup cold and for some baffling reason, loved the meaty/jelly flavor. They started sharing it with their friends, who also loved meat jelly. And so, the world got kocsonya. The last course was dessert. 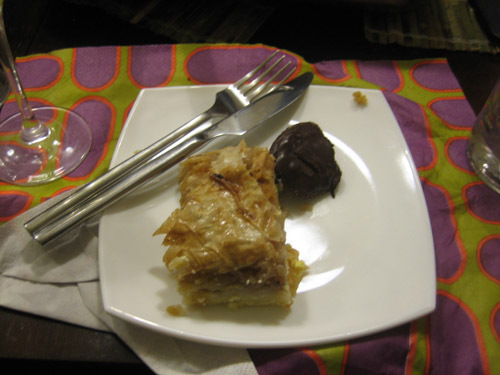 Strudel is a very traditional dessert from all the way back when the Austrians and the Hungarians were one empire. This strudel was lovingly made by Peter's girlfriend's grandmother. She is part of the last generation of people who make the strudel's flaky crust by hand, a process that can take hours. Next to the delicious strudel is what I have labeled Laura's Personal Heaven: the most fudgy, chocolaty mousse I have ever tasted. The end. The evening was a roaring success, and my culinary expert of a husband could not agree more. Really, how was the jellied meat soup? At least with this fish soup you didn’t see the little fishes alive right before they ended up in your meal like we did in China! woa…um, looks like you’ve found some good gluten free delicacies…and, well, makes me glad I can eat gluten. I’m having such a vastly different experience here in the midwest, you are stripping my gears, LB. I’ve been on a food journey of late (and right now I feel awfully Midwestern after looking at your adventures)…making the most of my furlough! Miss you and I’m looking forward to seeing you soon! will you please make me some gelatinous meat soup? What fun! Everything sounds so exotic and most of it looks great… the chocolate (YUM!) and maybe not so much the gelatinous soup? Very brave you and Chris are! (and very “yoda” that comment just sounded!) Hope all else is well with you two! XOXO!